With gold at record high prices, like many others, I started looking at my jewelry to see if there were any odds & ends I could sell. Broken chains, single earrings, and other such pieces. This got me to thinking about what I have, where they came from and what the items mean to me. Some pieces hold such sentimental value that I would never sell them. One of my treasures is the gold coin necklace my mother gave me years ago. Along with the gift came the story, the family history tied to the coins. This piece of family lore makes the coin necklace a treasure beyond price. My great-grandmother, Theodosia, was born in Mississippi in 1858. According to family stories she received my coin, a 2 1/2 dollar gold piece dated 1851, as a birthday gift. Dosia lived most of her life in Tennessee where she died at the age of 82. She gave two coins, mine and another dated 1850, to my grandmother who in turn passed them on to my mother. 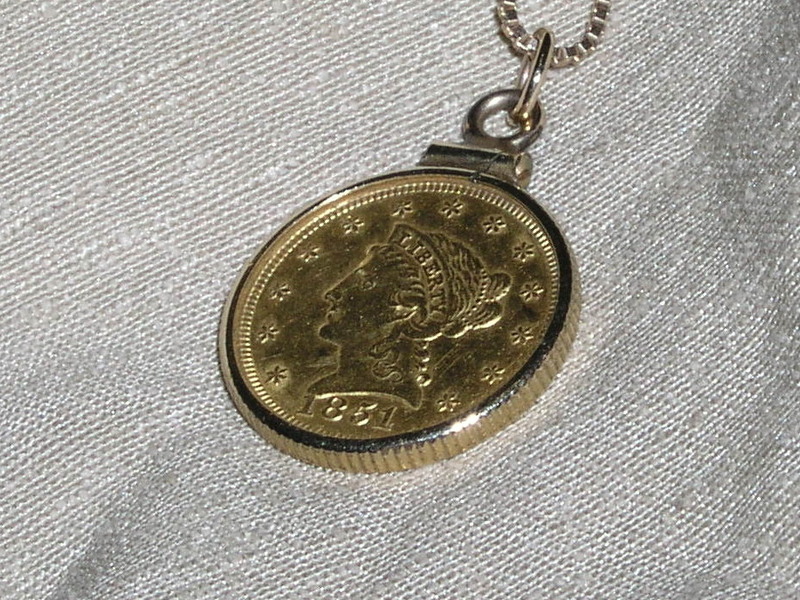 After having the coins set in bezels so they could be worn as necklaces, my mother gave them to my sister and me. That explains how I came to own the coin, but it doesn’t tell the whole story. I can only speculate on the origin of the coins. Did they come from Dosia’s father or, perhaps, her grand-father? Was it a family custom to give the children gold coins on their birthdays? Did her mother put the coins away so that Dosia and her siblings would have them when they grew older? Whatever the plans for the coins, the outbreak of the Civil War in 1861 changed everything. Dosia’s father, R. B. Sizemore, enlisted in the 26th Mississippi Infantry, C.S.A. Her mother, Elvira, remained behind to tend the farm and their four children. Late in 1864 R. B. Sizemore died a result of some unknown disease, rather from battle wounds. From the history of the 26th, the date he enlisted and his death, we can surmise that he participated in the Battle of Ft. Donelson (Feb. 1862) where he was taken prisoner and exchanged six months later at Vicksburg. During the following year the regiment defended Mississippi, Louisiana and Alabama against Grant and Sherman. Then in May, 1864, they journeyed east to Virginia where they fought in the Wilderness Campaign, the Seven-Days battles around Richmond and finally to Petersburg. There is no way for us to know when R.B. became ill. We only know he died in Mississippi in December, 1864. Sometime during the war, either before or after R.B.’s death, Elvira hid the gold coins in a stump for safekeeping. She probably stashed more than the two coins, but we will never know what treasures she hid away so that they would not be stolen in those uncertain times. My great-great-grandmother remained on the farm in Mississippi until 1867 when she took her children north to her mother-in-law’s home in Tennessee. Theodosia was nine years old. After her mother remarried in 1870, to her father’s brother, Dosia went to live with another of her father’s brothers, R. H. Sizemore. This uncle was a doctor who had served as a surgeon in the Confederate Army with his wife, Sallie, by his side as his nurse. During the time Dosia lived with her aunt and uncle, she must have met her future husband, John Uffleman. He was the oldest son of German immigrants who came to America in 1850 and settled in Beaver County, Pennsylvania. John’s family did not participate in the Civil War. In 1867 his entire family left Pennsylvania, came down the Ohio River, then up the Cumberland River. They bought enough cheap land in western middle Tennessee along Wells Creek to divide into separate farms for each son. Dosia and John married in 1879. My grandmother, Elvira, born in 1893, was the fourth of five children to survive to adulthood. The family lived on the farm on Wells Creek until John became unable to work. Sometime around 1905 they sold the farm and moved to McKenzie, Tennessee, where they ran a boarding house near Bethel College. My grandmother told me that they left the farm when she was 12 so I’ve calculated the date based on that. During their time in McKenzie, my grandmother attended Bethel College. After their oldest daughter, Lois, died in 1911, John, Dosia and their two younger daughters returned to Houston County, near their former home, to help raise the grandchildren. Theodosia Sizemore Uffleman led a fascinating life spanning the years from before the Civil War until the beginning of World War II. That’s a big chunk of American history. The coin pendant gives me a tangible connection to the places she lived, to the events of her personal life and to the historical events of the time. When I pass it on to one of my grandchildren, I also hope to pass along the story of Dosia’s coins.